As a parent speaking the minority language with my own bilingual children, I know it can sometimes be difficult and stressful when kids won’t speak your language. 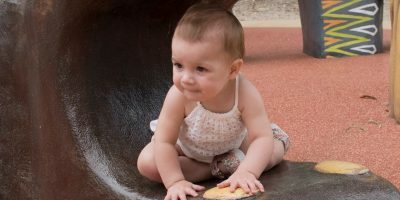 I have compiled a list of ways I have found helpful to boost the minority language based on my own experience as a mother, and language teacher. 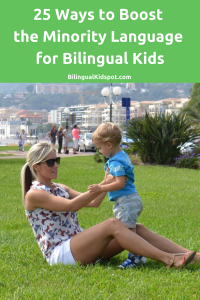 I hope these tips can help you and your bilingual kids. Creating the need to speak the minority language is crucial. If kids don’t have the need to speak the language, then why will they? Whether it be to talk to someone, or to play a certain activity or game, there must be a good reason for them to be motivated to use the language. Here are some ideas to create the need for the minority language. Spend as much time together where possible, one on one. This is especially important if you and your partner speak different languages with your children. When you are all speaking together, they may be continuously switching the languages, or just answering in the majority language. By spending one on one time where you are speaking ONLY the minority language, there will be less distractions. This seems obvious, and I probably repeat this a lot. BUT… Talk as much as you can with your child every day, and encourage them to speak back with you. The more you talk, the more words they hear, and the more they learn. Play music and sing songs in the minority language. A melody helps children memorise words and phrases that they wouldn’t otherwise be able to, and lyrics help to broaden vocabulary. It can also be a lot of fun! Read more about how you can use music to help improve the minority language. Don’t underestimate the importance of reading books. Make sure to have lots of different books available in the minority language, especially your child’s favourites. Let your child choose new books regularly to motivate them. If they like the story, most kids will be happy to read it in any language. Check out our booklists in English, Spanish, and Hindi. This works particularly well, and is a great motivation for kids to practice the language. Introduce a puppet, a doll, or other type of toy they love. Tell your child that it ONLY speaks the minority language. This will make language learning fun and may give your child the motivation to start talking. Try to establish the minority language, as the language your children speak between themselves. This is no easy task by all means, but there are ways to you can encourage them. Read here how you can establish the minority language as a target language with your kids. If you are a working parent, finding a bilingual nanny or au pair who speaks the minority language is a great way to give it more exposure, while taking care of your childcare needs at the same time. The important thing is that they only speak their native language to give your child the “need” to speak it to communicate. I cannot stress enough the importance of reading to your child every single day. Whether it is with their bedtime routine, or just throughout the day randomly, installing a love of reading is one of the best things you can do for your children. By reading to them every day, you are feeding them new vocabulary and exposing them to new words they may not otherwise hear. Even when your child is old enough to read themselves, you should still be reading to them. Immerse your child in the language by travelling to a place where everyone speaks the language. It may not always be possible for all families but it is a fantastic way to improve your child’s language skills. If you have family abroad, take advantage and visit when possible. Otherwise try to take advantage of family holidays and choose destinations where your child can practice his or her language skills. A bilingual education gives your child exposure to both languages daily. Research the bilingual nurseries or schools in your area to see if there is one that offers the target language. International schools and Bilingual schools enable your child to learn not only to speak the language, but also to read and write in both languages. If you allow screen time for your bilingual child, use it to your advantage. Let your child watch programs and play games in the minority language to give them more exposure. Check out our list of kids shows and cartoons in: English, Spanish, Italian, Chinese. For birthdays, or Christmas, buy your kids language learning gifts. 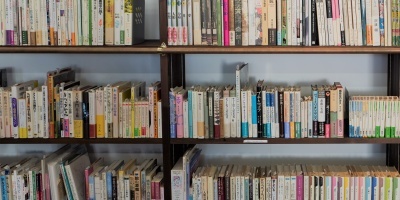 Things such as books in the minority language, or puzzles and games that encourage them to talk and use the language. Games promote talking, and they are fun! Also, kids usually love to win, so that gives them motivation to use the language. Allow your child to choose games that they are interested in and they will keep motivated. Word Games such as I-spy, word bingo, cards and board games are usually great motivators to get kids talking. Puzzles can take time, and there is the need to work together, and to talk and play together, which is encouraging language development. Puzzles are a fun way to spend time with your children working on a task together. Learn about your culture by cooking different dishes from around the world. Learn new vocabulary in the kitchen working together to cook a meal. Follow your child. Let them choose what they want to do. Let them take the lead on an activity and then work on it together. Whether it be colouring, playing with a certain toy or game, or just playing pretend, go along with it and they will be more motivated to talk. You can find a range of activities and materials to encourage your child’s language development in our Montessori Language post. Speak with your child, not just to your child. Speak together about anything and everything. Instead of asking yes or no questions, ask open ended questions so they feel the need to explain themselves. Read more about how you can use conversation to aid language development. If what you are doing is not working, consider trying another method. There are a many different methods parents use to raise bilingual children, and you can also adapt a method to suit your family situation. Perhaps OPOL isn’t working because there isn’t enough exposure. If both parents speak the minority language, perhaps you could switch and use the Minority Language at Home approach. For older children, immersion camps can be a great way to give exposure to the minority language. Being fully immersed in the language for a few weeks can really make a significant impact and improve your child’s language skills. Find resources online for your child in the minority language. There are a range of fun language apps, language programs, blogs and websites that promote language learning and can help your child. You can find FREE online lessons and printable activities in our Spanish for kids and Chinese for kids learning series. We also have a long list of Language Learning Resources that could be helpful for multiple languages. Bedtime stories are not only a way to bond with your child after a long day, but they also introduce your child to new vocabulary each day. By reading out loud to your child and discussing the story, you are helping your child with their language development without even realising it. Be positive, encourage your child to speak the minority language without forcing them to do so. Never use negative consequences such as punishment if they won’t speak back with you. There is always a reason your child won’t speak your language. Find that reason and work on helping them. Consistency is the key to raising bilingual kids. Whichever language method you use, or language you speak with your child, be consistent and eventually your child should feel the need speak back to you. I love the Mary Poppins quote “In every job that must be done, there is an element of fun”. Ok she was talking about cleaning up but it is still relevant. If you make something fun, children will want to participate, as it won’t feel like a chore. There are so many ways to make language learning fun! Do you have any helpful tips that you use to improve your child’s minority language skills with your bilingual kids? Please share! Would you like to read more on Bilingual Parenting? Why not subscribe to receive other related articles. Be sure to like our Bilingual Kidspot Facebook Page. Follow us on Twitter, and join the private Bilingual Kidspot Discussion group! So you think not responding when your toddler speaks in the majority language is a good idea to encourage minority language use? Or will it hurt them? 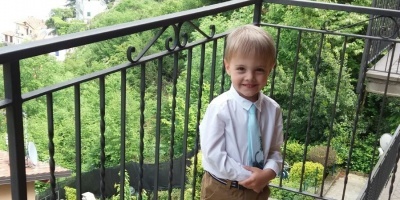 It is difficult hearing your child respond in the majority language. What I did was ask “In English, can you tell me in English”. It could be that they simply don’t have the vocabulary, so you need to model the correct language so they know what to say next time. Or they may not have the confidence. Instead of not responding at all, you could repeat what they should say in your language. “Eg. In English you say ball” or something similar. Consistency is key.